Tian An Men during the Ching Dynasty (1644 - 1911 AD) - The Ceremonial Gate north and in front of the large public space outside the Palace was rebuilt during the 8th year of the Sheng Zu reign of the Ching Dynasty, under its most powerful and longest ruling Emperor Kangxi.A Purple Wall was erected from TiananMen Gate to surround the Outer Palace and include what is now the Imperial Ancestral Temple, the Park of the Peoples Culture and in the West - the Square Altar at what is now Dr. Sun Yat Sen Park. 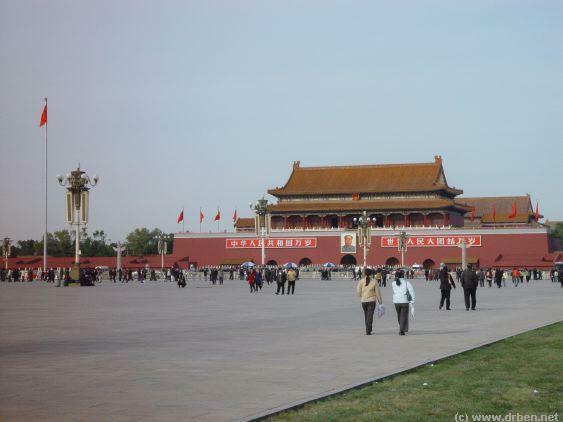 From then on the Southern-most Point of the Palace lay at Tian An Men - the Gate of Heavenly Peace, which at the Time was an announcement Gate. A View of Tian an Men and Chang An (Eternal Peace) Avenue from near the New National Theatre Dome. 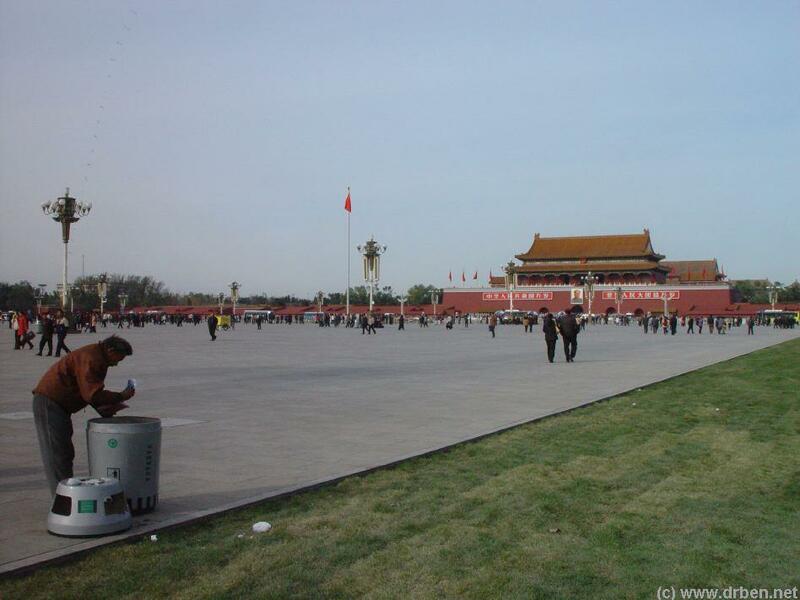 A Bum and makes the Best of things at TiananMen Square scouring through tourist litter for empty bottles and food. The Announcement Gate had a further important function when the Announcement of the Emperor's Death came. 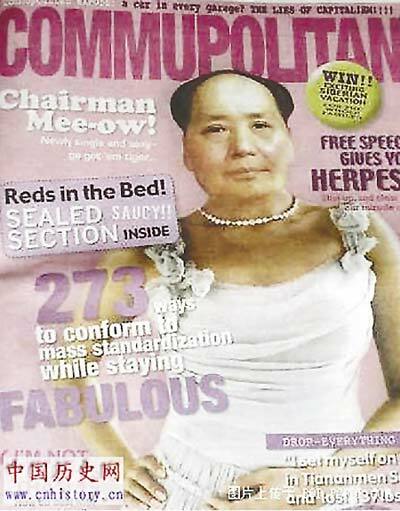 Here the succession of a new Emperor would be announced, and later a new Empress appointed. 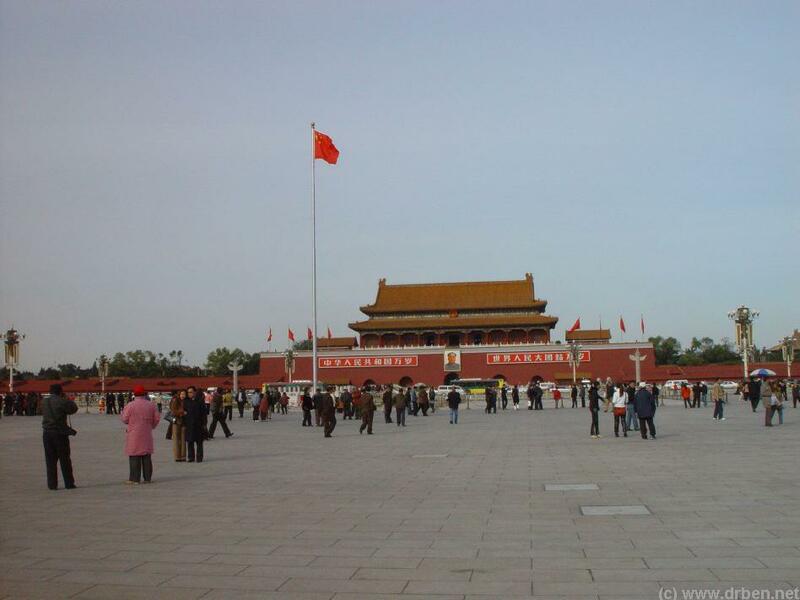 Panorama of Tian' An Men , the famed Gate of Heavenly Peace at TiananMen Square at Sundown. 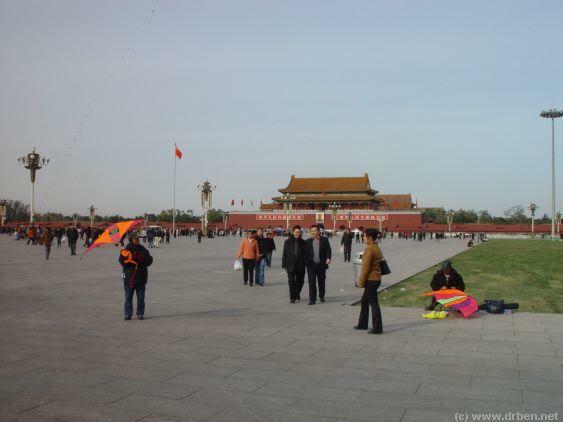 Crowds milling around on TiananMen Square in front of Tian'An Men and the proud National Flag with it's Ceremonial Guard. The Ceremonial Guard moving out of the Forbidden City at Sundown, en route to the daily Flag Lowering Ceremony. One of the oldest Tourist traditions in Beijing - one has to have flown a Dragon Kite from TiananMen Square ! 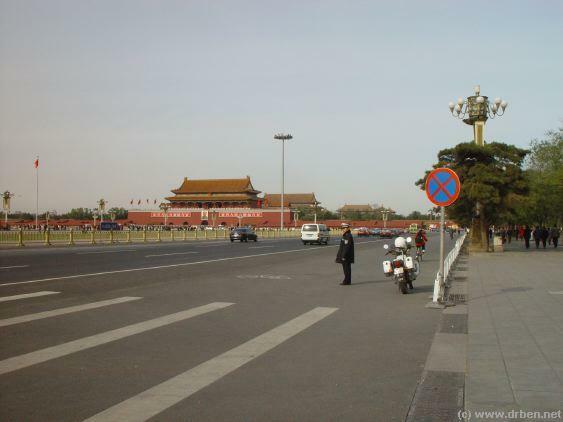 Street-crossing onto TiananMen Square at the height of West Legation Street, which is accesible from TiananMen Square. 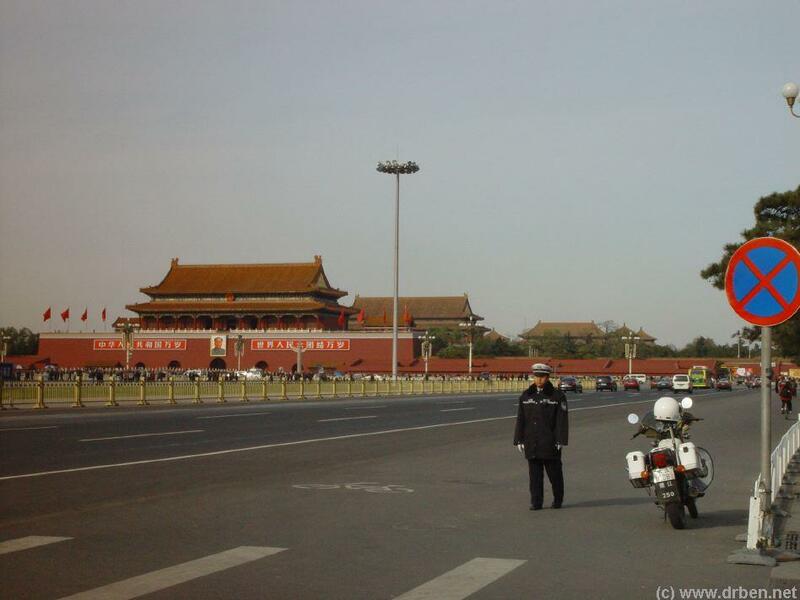 The ever present traffic police providing security and checking traffic at the National Museum at TianaMen Square. 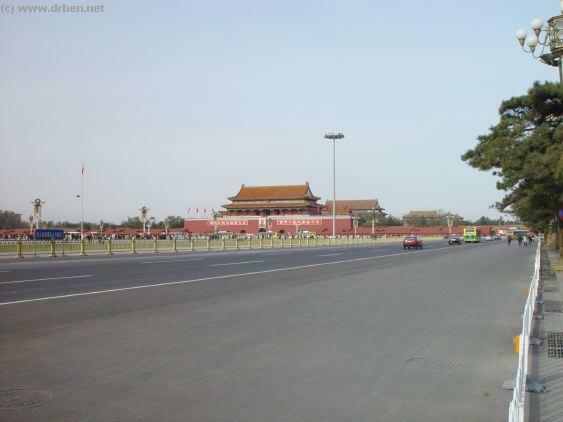 View of northern half of TiananMen Square with TiananMen, DuanMen and the Main Entrance Gate (Wu Men) of the Palace in the distance. Origins of Tian An Men - Tian-an-Men was first constructed in the year 1417 AD, in the Yongle Reign of the Ming Dynasty (Cheng Zu) during the very first years of the Imperial Palace. At the Time it was named and known as Tiang Tien Men. It was the outer most Gate of the Palace standing on the long central axis of the Imperial City, the south to north entrance route into the city. 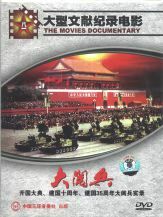 Tian An Men + Square : To Tian An Men Square and Menu with more information on the Square and the Gate of Heavenly Peace. 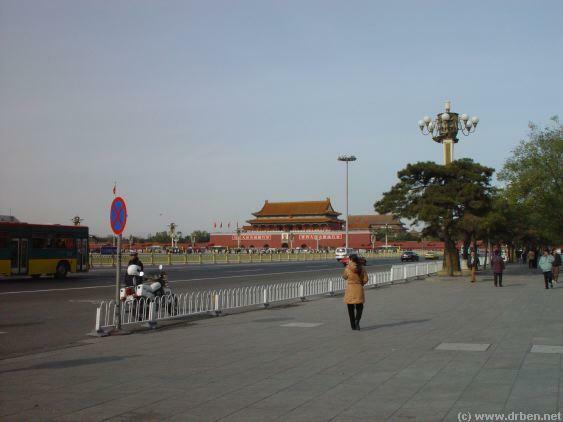 from Tianan Men lead through the southern districts of the City to the Temple of Heaven, where the Emperor would pass through the circular outside Wall into the realms of Heaven. The complex Rituals at TianTan would lead the Emperor through several more stages of Heaven before being able to directly communicate with the Heavens (God). was as Platform for announcements to the common folk and citizens. 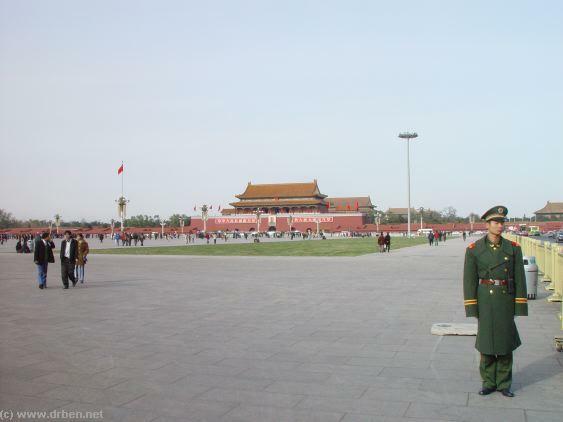 At TiananMen new Imperial Edicts directed at the People were read out in Public, thereby announcing the Law of the Land & Empire. 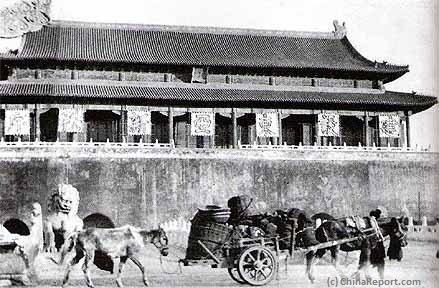 Among the other functions of Tian An Men was that as ceremonial Entrance to the Palace for the Imperial Relatives. Sound Bonus - Most Important excerpt from the historic Mao Zedong Speech at Tian An Men , the declaration of the Peoples Republic of China on October the 1st of 1949 AD. 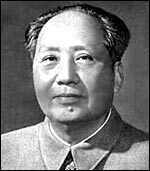 Chairman Mao declares: "I announce the Establishment of the Peoples Republic of China" and ends with the very important words "today the chinese people have arisen". 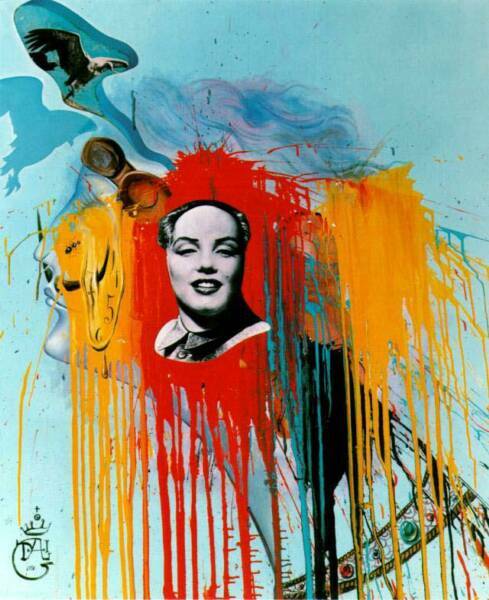 Words that will finally reach the full scope of their meaning on the opening day of the 2008 Olympic Games in Beijing, when China will present itself to the world as a new and modernized nation with an important place in World Culture. 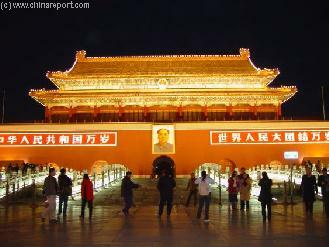 Tian An Men Gate and the Revolution (In and After 1949 AD) - The Gate has two inscriptions. 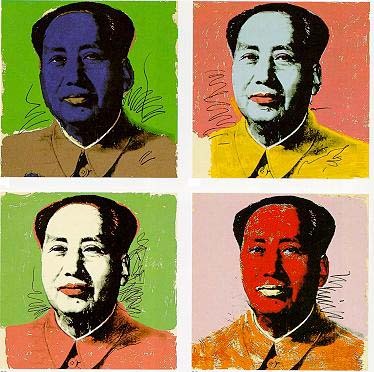 The one on the Left declares "Long Live the Peoples Republic of China". 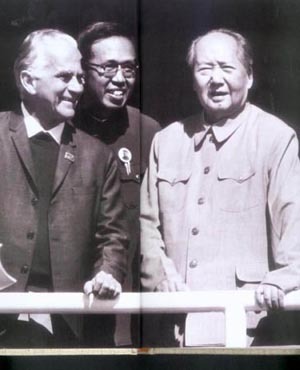 The second one on the Right declares "Long Live the Great Unity of the Worlds' Peoples". ended. The Lone Man was subdued and hauled off in a Van, while the flames were doused with extinguishers. 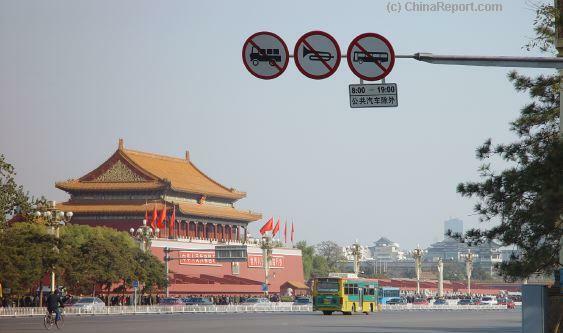 Immediatly TiananMen was cordonned of to prevent close-up views of the damage. However, some video-footage and digital photos of the attack made it out into the world. 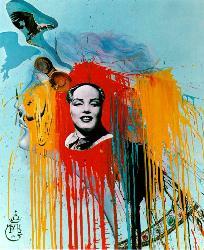 The incident was reported on CNN International and the BBC World Channel. slight damage had been done, but not much else was reported. The backgrounds of the whole affair remain somewhat of a mystery. Unity with the other common Citizens of the World. Mind you, these words these words still hold their truth today, and will beget a whole new meaning with the Opening Ceremonies of the Beijing Olympic Games, expected on the symbolic (ad auspicious) date 8-8-2008. 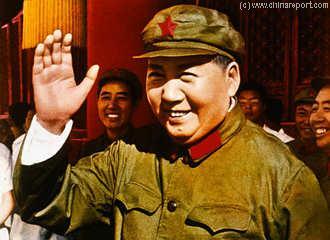 The Olympic Games of Beijing will open a New Era for China as well as the Chinese Communist Party and it's Leadership. 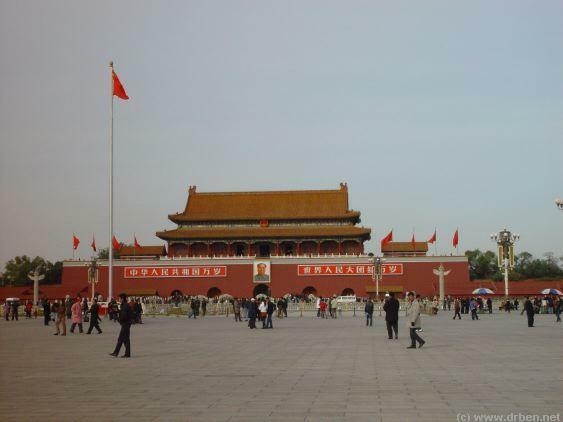 citizen, was kept well outside of TiananMen Gate, where a small river and the five white marble bridges separated the masses from the Great Within (Da Nei). 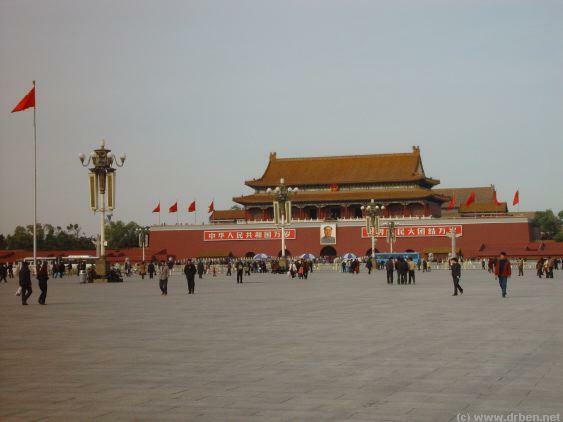 The Gate was then known as Guo Men - Gate of the State and the White Pillars outside of Tian An Men, still standing today, were pillars where the public could proclaim their complaints to the Emperor and Court. The Public could further hear the official announcements made on behalf of the Emperor shouted down from the Gates gigantic platform. Tian-an-Men,The Gate of Heavenly Peace stands at the North-Side of Tian an Men Square, the Square of Heavenly Peace, the largest square in the world. Known through a long history as the Gate to make Official Announcements to the Chinese People, on October the 1st of 1949 AD TiananMen was the chosen Site for Mao Ze Dong, the chairman of the Chinese Communist Party to declare the Rise of "New China", the Peoples Republic of China, a communist State for the common people no longer ruled by Feudal Lords. As he declared in his speech from the high platform of the Gate to those gathered below in (the then smaller) TiananMen Square : "On This Day, the Chinese People have Arisen". 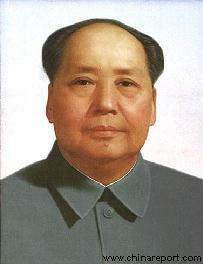 Eversince, the Tian An Men has symbolized the Chinese State throughout China and the world. Through the succeeding years Tian An Men, the Square and the large Avenue below it, the Avenue of Eternal Peace (Chang An Dajie'), have become fixed in the mind of the world as the site of huge mass gatherings and the Gate along which the Red Army (Peoples Liberation Army - PLA) marches on the grand birthdays of the Revolution. 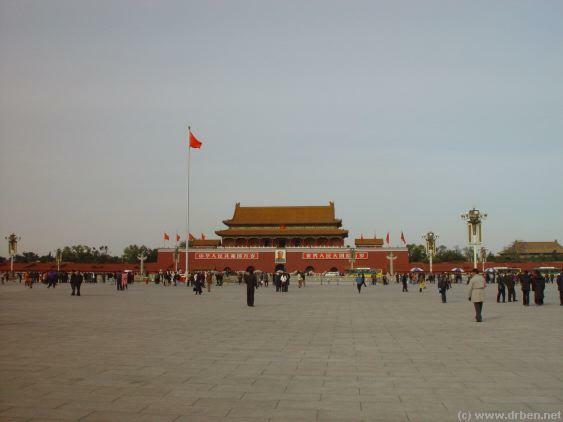 to honor Chairman Mao during the Cultural Revolution, the funerals of Mao Zedong, Chou Enlai, Deng XiaoPing and the later tragedies of Tian An Men Square of 1989 AD, they all happened underneath this Gate. Today Tian An Men - The Gate of Heavenly Peace and the symbol of China stands colorfully and massive, measuring 33 meters and 7 centimeters in height. The magnificent Gate forms entrance point to the passage from Tian An Men through Duan Men to the South Gate of the current day Palace Museum, the Wu Men. 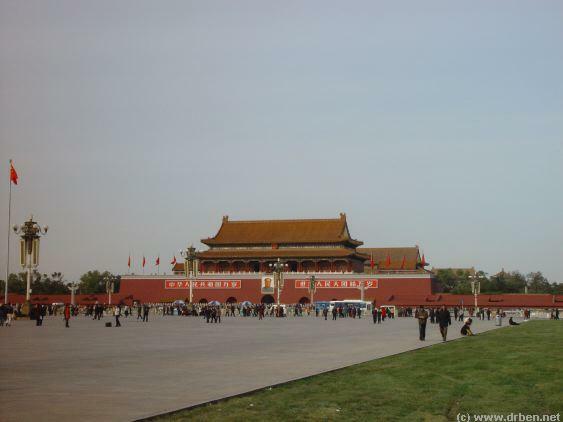 On occasion, the Platform of the Tian An Men is opened to the Public, offering a very special and historic view of Tian An Men Square and surroundings. 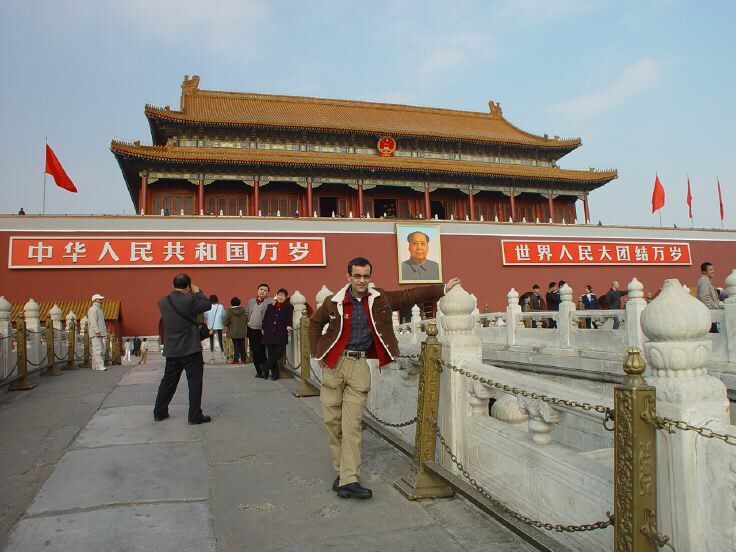 Dr. Ben at the famed Gate of Heavenly Peace at TiananMen Square in 2002. 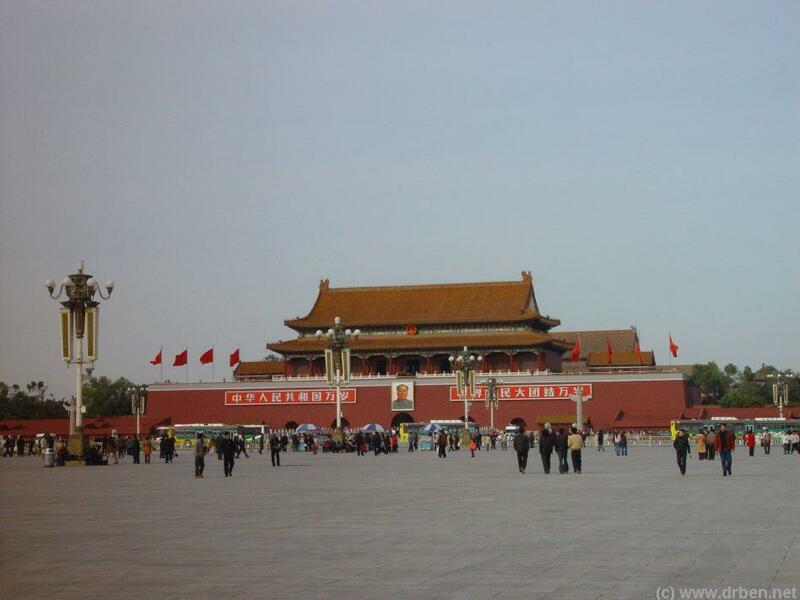 The Large Space on Tian an Men Square in front of the Gate, recently the location of the 'we are ready" 1 Year to go Ceremony for the 2008 Olympics. An artist impression of a famous moment on the Platform of Tian An Men. 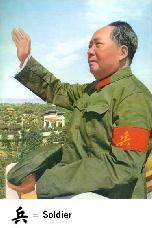 Chairman Mao is welcomed by officials and the huge crowd below in TiananMen Square.